There isn’t much difference in mating and reproduction within the subspecies of Eastern Gorillas. There is no birth season and mating occurs year-round. Females have a menstrual cycle that lasts for 28-33 days much like that of female humans. There is a period of fertility which lasts 1-4 days and when the egg is unfertilized the mucus membrane of the uterus is flushed out and the bleeding lasts for 2-3 days. If the egg is fertilized and the female reproduces there is a 3-5 year period where ovulation ceases. Mating for the Eastern gorilla is a very interesting process. Females usually initiate the mating process by pursing her lips and maintaining long eye contact with a male. If he doesn’t respond she may touch him or slap the ground in front of her to grab his attention. When males initiate the mating process they either touch her or get attention using a vocalization called a train grunt. When it comes to the actual bearing of young the gestation period lasts for about 8 and a half months and the pregnancy itself lasts for about a half hour. 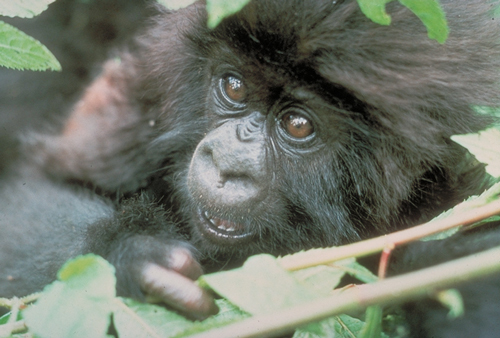 Newborn gorillas are rather undeveloped weighing about 2.2 grams on average and being mostly blind and uncoordinated. Females nurse the baby for about 2 years but it begins to walk on its own at about the 4th or 5th month. At about this time they start to bite on plants and a few months later they’re ingesting them. Females nurse, carry, teach, groom, and play with the young until they’re about 4 years old. The males protect them during this entire time until they are between the ages of 6-8 when the females begin to ovulate and the males develop the silvery back hair and large canines of adulthood at around age 15. Females usually leave the group and find males and males leave and go find a new area where females can join them. This process has a slow reproductive rate which has females producing about 2-6 young over the span of 40 years. This is sometimes solved by the males. Since gorillas are polygamous the dominant male has pick of all the females so sometimes males will have 3-4 different females and produce 10-20 offspring over the course of 50 years. Full grown Eastern Lowland Gorillas can reach weights of 500 pounds and heights of 6 feet and Mountain Gorillas can be anywhere from 200-400 pounds and be 5 and a half feet tall.